Roman bricks and tiles have been found in the construction of Great Wakering church so it is possible that the local brick industry may have a very long history indeed. Before the 1860s a few brick yards existed in Wakering as bricks were needed for, at least, the chimneys in wooden and wattle and daub buildings. These early brick yards were small, family owned, affairs. They usually had a horse driven pug mill where the brick earth was mixed with water and lime and a small bench where the bricks were moulded. Digging out the brick earth resulted in a lowering of the soil level, evidence of which can still be seen at the southern end of Exhibition Lane which is called Brick Lane by some of the older inhabitants. By the beginning of the 20th century, the brick making industry had grown so much that the total workforce was larger than that in all other forms of local employment. From census information it can be seen that the population of Wakering had increased nearly three fold in the previous century when that of the surrounding parishes had either decreased or remained static. 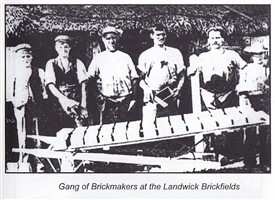 The early years of the 20th century saw the peak of the brick making industry at Wakering with both the Landwick and Millhead yards together employing more than 600 men, women and boys. In 1918 the Landwick site was worked out and closed. The equipment was transferred to Millhead which was further expanded but which, itself, was closed in the 1960s. Gradually the hand making process was displaced and brick making machines were installed. There was a decline in the number of men employed but the new ranges at Shoebury offered alternative employment. In 1936 a new brick field was opened in Star Lane by The Milton Hall Brick Co. A hundred years after the high point of Wakering brick making this works was also closed. 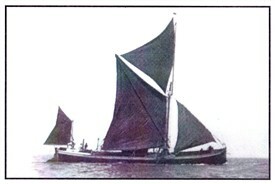 Sailing barges had been owned and worked in the rivers and creeks around Barling, Wakering and the islands since the early 1800s. Before the coming of the railway and proper roads they were the only economical way of transporting large, heavy loads. Ideally suited to navigating the shallow waters around the Thames estuary due to their flat bottom and wide beam. 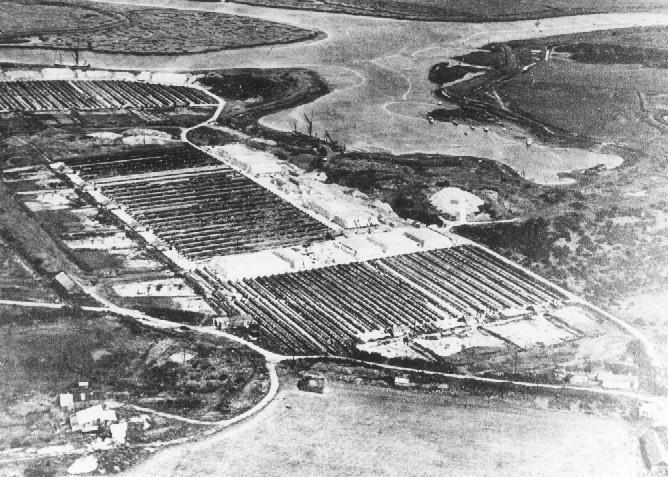 Many of the vessels used locally were owned by Rutters, who had an interest in the Wakering brick fields. There were at least eight barge owners at Barling and a further four or so at Little Wakering. Most of these were engaged in the transportation of corn, hay and straw, and were sometimes called "stackies" because of the great stacks piled on deck. 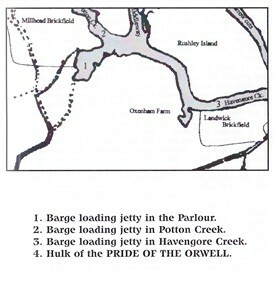 Other barges carried flint and tarmac which were hauled from the hold in baskets and used to reinforce the seawalls around Wakering, Barling and Foulness. The barges, known as "brickies", would be loaded with 45,000 bricks at a time, about a week's production. In the 1920s the going carriage rate for a load to London was 15 pence per 1000! The other cargo carried by the brickies was sand. This was dug out of the sandbanks off Leigh by hand using a wooden bladed spade with a steel edge. It was very hard work and when they reached Wakering the crew had to unload the sand, again by hand, and barrow it over the seawall to the brick fields where it was spread out and dried. The sand was then used in the sanding of the brick moulds to prevent the wet clay from sticking in the moulds. 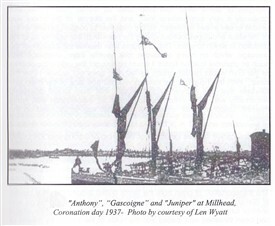 Rutters had built their last four barges, the “Anthony”, “Gascoigne”, “Juniper” and “K.C.” in their Crayford, Kent, yards around the time the Landwick brick field was closed. The last barges sailing from Wakering with bricks left around the 2nd World War by which time lorries were carrying these heavy loads. This page was added by Sue Horncastle on 26/02/2012. 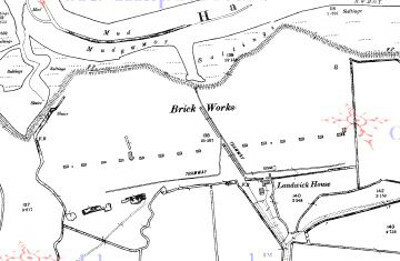 Here is an extract from the 1897 O/S map showing Landwick brickfields complete with tramway. 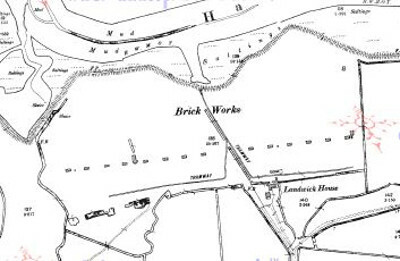 The Landwick site was worked out and closed by about 1900. 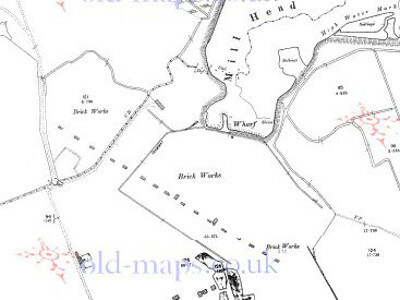 Here is an extract from the 1872/73 O/S map showing the Millhead brickfields again complete with its tramway and wharf. and again on the 1897 map. By 1923 the operation had moved slightly to the north with two more wharfs in use and again with a tramway shown on the maps. 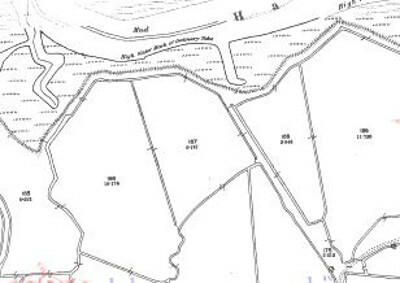 The Landwick site was still shown as a ‘works’ on the 1961 map but by 1867 a slipway had been added to the wharf on Potton Creek and a boatbuilding yard had been established. 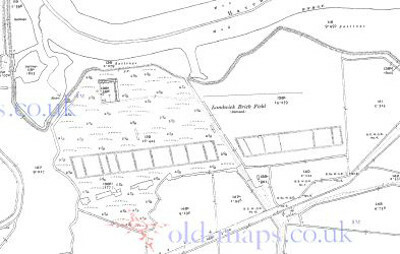 (RDCA thanks the generosity of www.old-maps.co.uk for the use of all the above map extracts for non-commercial purposes).